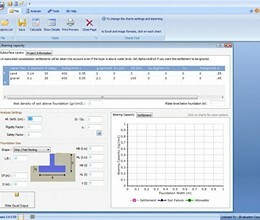 Peysanj is a series of geotechnical engineering modules such as bearing capacity and settlement, pressure-meter test, plate loading test, soil liquefaction analysis, etc bundled as single software. Each type of analysis is provided along with calculation details and detailed reports. Allowable bearing capacity should satisfy both shear failure and settlement criteria. 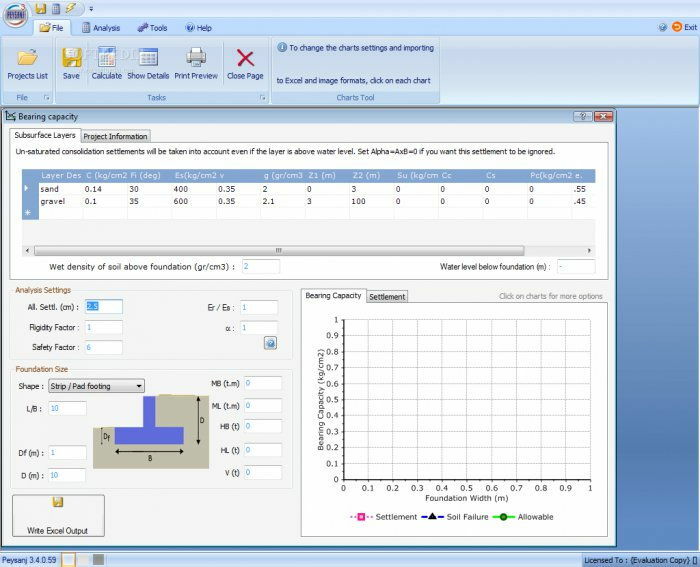 PEYSANJ uses Hansen method for analysis of soil shear failure by considering the effect of groundwater table in bearing capacity analysis. For settlement analysis, Steinbrenner and Goodier (Timoshenko) and rigid foundation formulas are used for immediate (elastic) settlement and one-dimensional Terzaghi consolidation formula is used for consolidation settlement. Total settlement of the footing is then calculated by summing up the elastic and consolidation settlements. For each footing size, the minimum values of allowable stresses for shear failure and settlement criteria are compared and the introduced as the "Allowable Bearing Capacity" of the footing. * Peysanj download link provides trial version of the software. Peysanj has been rated 3.4 out of 5 points. A total of 5 votes cast and 0 users reviewed the software.